Did you ever see that ABC documentary from the ‘90s, The Beatles Anthology? There are interviews with the surviving Beatles about various parts of their work and legacy, and at one point they’re asked about the sometimes-debated idea that a sprawling and adventurous double album of theirs — The Beatles (known by most of humanity as The White Album) — should instead have been released as a nothing-but-polished-diamonds single album. I have a similar feeling these days. I’m on a little bit of a roll, having just jump-started my creative battery by writing thirty poems in thirty days in April. Some of them were even pretty good. Still, it’s true, that I have felt a bit frustrated from having old work scattered here and there, unpublished or otherwise inaccessible, maybe in media formats that don’t exist anymore, like the cassette of kid’s songs I wrote in the early 90s? Some stuff feels likely to be lost, whereas I want it out there in the world! Whether it’s ignored or enjoyed, I want to feel like I’ve published it (that is, made it public). I feel some loyalty to it, and some unsettledness that it didn’t quite get its moment, at least not sufficiently. That’s part of why I was so happy to have “Train I Ride (1953)” recently published online in the new issue of The Museum of Americana. For those reasons, one of the things I want to do on this blog/portfolio site is to archiving some older work I don’t want lost. In that spirit, here’s an educational video I wrote, explaining the concept of Fact Families. This was part of a math course by Ignitelearning! (I’m not being over-enthusiastic, btw, the exclamation point is part of the company’s name). This piece was animated by hotshot animator Don Smith, arranged and performed by Jason Molin, and produced by the omnicompetent Erich Pelletier. This was a period where my work was particularly fun, creative, and satisfying, not least because I was inspired by all the talent around me, so you’ll surely see a few more of these from time to time. But back to my main point: let’s test George Harrison’s theory, shall we? By his logic, I should be ready to do some cool new work. I’ve just had a favorite old poem published. I’ve recently gotten to do a very fun performance of (mostly) older poems at the Austin Slam Anniversary show. Right here, and not long ago on facebook, I’ve linked to some fun old educational media pieces. Will it make room in my heart and head for something new? 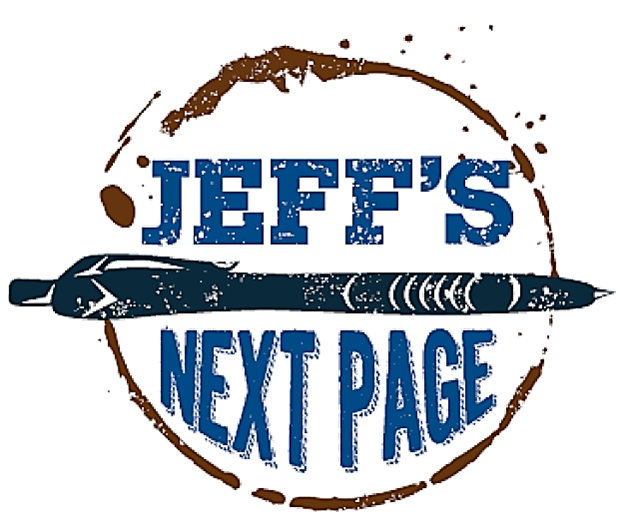 I mean, the name of this blog isn’t Jeff’s Back Pages. This is mostly about the next page! Therefore: I hereby commit to posting something brand new, whether that’s prose fiction (a story or maybe even the start of a novel), poetry, or song. Something. New. It’ll be published right here next Monday morning, same bat-time, same bat-channel. It will not be something that’s already underway. It’ll be something I begin from scratch, starting pretty much as soon as I click the “make it so” button on this very blog post. So I’ll see you here next Monday with, um, something. New.